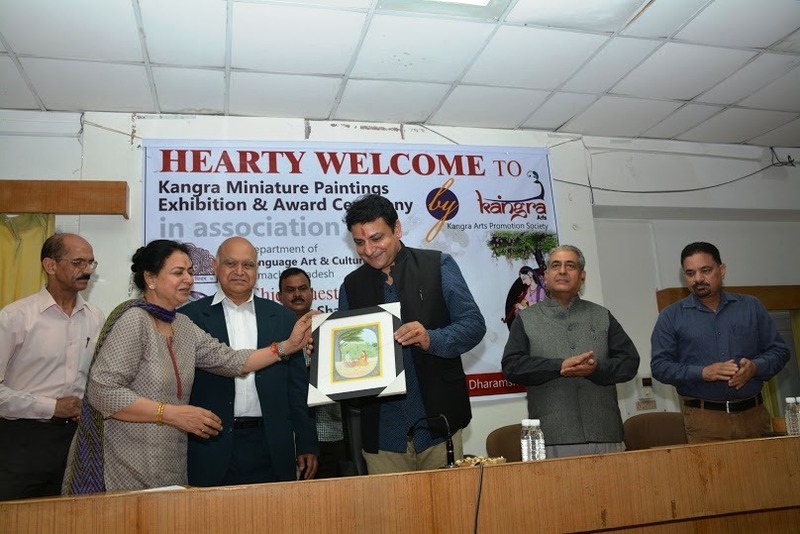 The Kangra Arts Promotion Society (KAPS) organized an exhibition and ceremony to honour Kangra miniature artists who have received national or state level recognition in association with the Department of Language Art and Culture, Government of Himachal Pradesh. Sh. Sudhir Sharma, Honourable Minister for Urban Development, Housing and TCP presided over the function as chief guest and presented awards to the artists. The event was held today at Government Degree College. The event saw healthy participation of more than 300 people from various walks of life to see the exhibition. Along with the chief guest the other dignitaries present were Sh Balbir Tegta, Chairman, State Education Board, Sh Balbir Thakur, ADM, Dr Akshai Runchal, Vice president Kangra Arts Promotion Society and Sh S K Pathak, Principal Government Degree College. While giving his welcome speech, Dr Runchal, spoke about how he chanced upon this project in conversation with Mr B K Aggarwal, the then Divisional Commissioner of Kangra. Subsequently it was efforts of Mr Aggarwal, Dr Runchal and Mr Bharat Khera, the then DC of Kangra, that the school of Kangra miniatures was setup in 2007. In its 9 years of existence, the artists of KAPS have brought laurels to the state by winning national and state level awards in number of competitions across India. Sh Sudhir Sharma, remembered how he had got a painting of their Kul Devi, made in Kangra style and has it placed in the temple at his home. 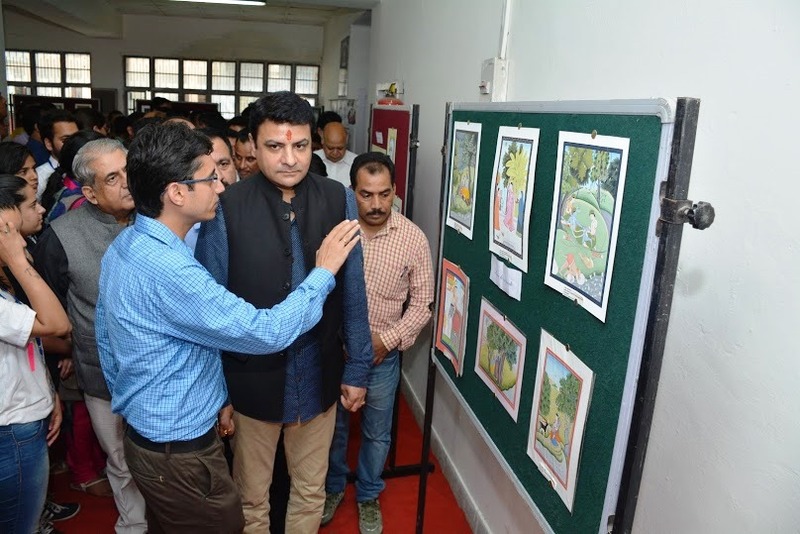 He also promised support to promote Kangra miniature work through upcoming art and exhibition centre envisaged in the Dharamshala Smart city project. Sh Mukesh Kumar, Sh Dhani Ram and Sh Om Sujanpuri were among the 9 artists awarded at the function. In the closing remarks, Sh Varun Rattan Singh, Secretary KAPS, spoke about work done by the society in digitizing more than 200 paintings though a project granted by the Ministry of Culture, Government of India and affiliation of the artists and their paintings for Geographical Indicators. 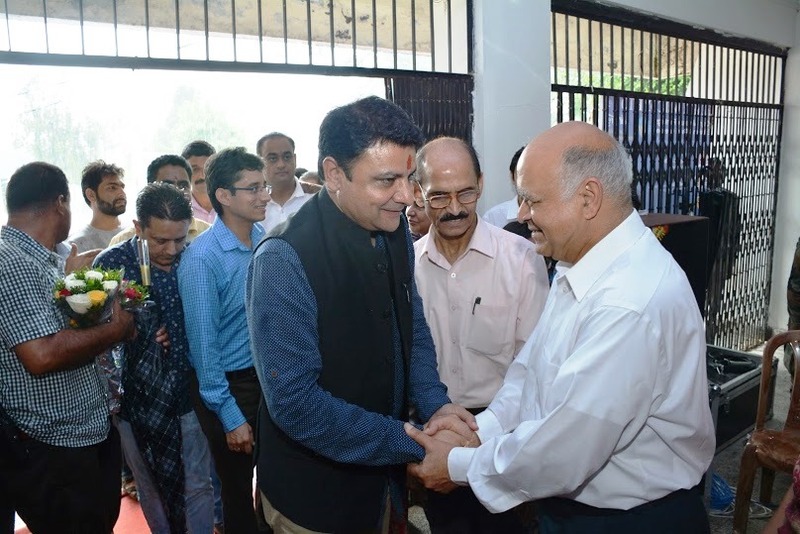 He also thanked Sudhir Sharma for giving his valuable time and buying more than 50 paintings in last 2 years as gifts for official and personal guests.